On Passover Saturday, I Tweeted that I was making Everything Bagel Bombs from the Momofuku Milk Bar cookbook and moments later I received this text from my mom: “Do you not know bagels are taboo on Passover or are you just stirring the pot? Most bagel stores in New York are closed.” I called my mom to talk it out—she wasn’t mad, but thought I’d offended my Twitter followers (I didn’t)—and then I set about making the dough and watching it rise. Weirdly, waiting for the dough to rise made me more reflective about Passover and its meaning than if I hadn’t made Bagel Bombs in the first place. Though I was born Jewish and raised Jewish and had a Bar Mitzvah and owned every Woody Allen movie on VHS, I’m not what you’d call a practicing Jew. I identify with Jewish culture (I’ll use a throwaway Yiddish word now and again, like “cockamamie”) and I once wrote a play about the Holocaust (“Tragedy at Camp Zebulon”) that got me into grad school, but do I believe that the Jewish version of the universe is a more sound explanation than any other religion’s? No, I don’t. After reading Joseph Campbell’s “The Power of Myth,” I view all of the world’s religions as a series of stories that people tell themselves in order to cope with the difficulties of life. There’s no shame in this—I’m sure during my own darker moments I might find comfort in religion—but at my present, sober moment, I consider religion a helpful crutch, one that assists people in making sense of an often cruel world. So there I was in the kitchen with my dough in a big red bowl, the yeast slowly working its magic and causing the flour and water to double in volume. Even though I knew, intellectually, that this exercise in breakfast-making was no more offensive to the universe than if I shaped the dough into little crosses and burned them, I did start to feel a certain guilt percolate within me. Was this the guilt of the Jewish mother, transmitted via cell phone, haunting me the way countless other sons of Jewish mothers have been haunted throughout history? Or was this something deeper, something more resonant within me: a larger guilt informed by my Jewish identity and my lack of respect for this incredibly important Jewish holiday? I have distinct memories of Passovers from my childhood: we’d go to my Aunt Rhoda’s house on Long Island. Aunt Rhoda and her husband, Uncle Jerry, had a house overrun with cats: cats clawing up the couch, cats racing down the staircase, cats rotating on the record player. Uncle Jerry, who’d sit at the head of the table with a yarmulke on his head and gray scruff on his face, would read authoritatively from the Passover haggadah. His posture and his tone of voice suggested a wisdom and a history as ancient as time itself; the air was solemn, though festive, and I remember sneaking a few sips of Manischevitz from my mom’s wine glass. I also remember searching with my brother for the afikoman; matzoh, wrapped in cloth, for which we’d win a small prize (usually a few dollars). As I got older, and we moved to Florida, Passover was spent with my grandparents at their retirement club. When it was time to ask the four questions (a job delegated to the youngest person at the table), I remember my family sent me up to the microphone to do the “Mah nish ta nah” in front of all the other grandparents and their less gung-ho grandchildren. My “CH” sounds were impeccable. “Um, going to the movies,” I think I said. And I didn’t feel guilty then; in fact, to be honest, I felt quite the opposite: I enjoy being provocative, rebellious, especially with my family. Their buttons are fun to push. But I pushed them too far the next morning with those Bagel Bombs. 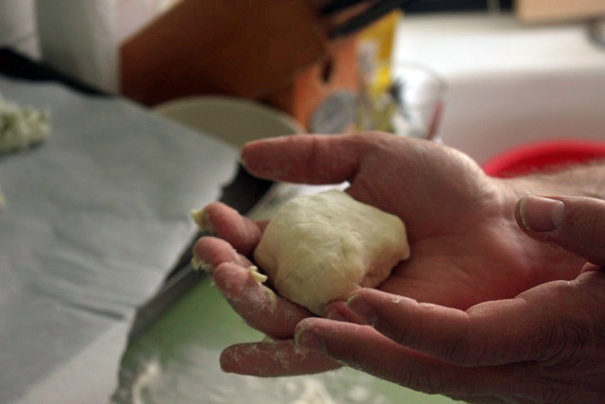 As I began to shape the dough, wrapping each mini-pizza around a knob of frozen cream cheese, I realized that this was less about superstition—less about fear of an angry God smiting me for my disobedience—and more about ignoring a cultural history that’s been beset with great tragedy. Passover specifically commemorates the Jews’ escape from slavery in Egypt; but it may as well commemorate our survival from the great crimes of the 20th century, most notably, of course, the Holocaust. If salt water on the seder plate represents the tears of our ancestors, then my making Bagel Bombs was a callous gesture, a willful act of insensitivity; amplified, of course, by my posting about it on Twitter. Still, my guilt disappeared the moment the Bagel Bombs came out of the oven and we started to eat them. If a seder is a culturally codified way of commemorating this specific history, couldn’t I commemorate it in my own way? Maybe making Bagel Bombs is a way of saying: look, we didn’t have time to let our dough rise as we escaped through the desert with Moses—and we certainly didn’t have this luxury in the death camps of the 20th century—but here we are now, in the present, we’ve made it through and here we are and we can let our dough rise before we eat it. Maybe that’s sacrilegious, maybe that misses the point, but that’s the story I told myself as I ate my Bagel Bomb and it’s the story I’m sticking to as I write about it now. The only question that remains is: how many seconds will pass before I get a text from my mom about this post?